Objectives of the Study: Robotic colorectal surgery is an emerging technology that may confer technical, clinical and ergonomic benefits. Furthermore, it has been suggested that right hemicolectomy serves as an ideal procedure to begin the learning curve in robotic colorectal surgery. We aim to compare the outcomes of laparoscopic and robotic colorectal surgery, and to assess the learning curve of this technology. Methods and Procedures: All patients who underwent robotic colorectal surgery and case-matched laparoscopic controls (matched by gender, ASA, and procedure) were identified from our prospectively maintained colorectal registry. Demographic and clinical variables were obtained from the registry and confirmed by chart review. Outcome measures assessed included: drop in hemoglobin over 24 hours, estimated blood loss (EBL), peri-operative blood transfusions, number of lymph nodes harvested (oncologic cases), operating room set-up time, length of operating time (LOR), and length of hospital stay (LOS). 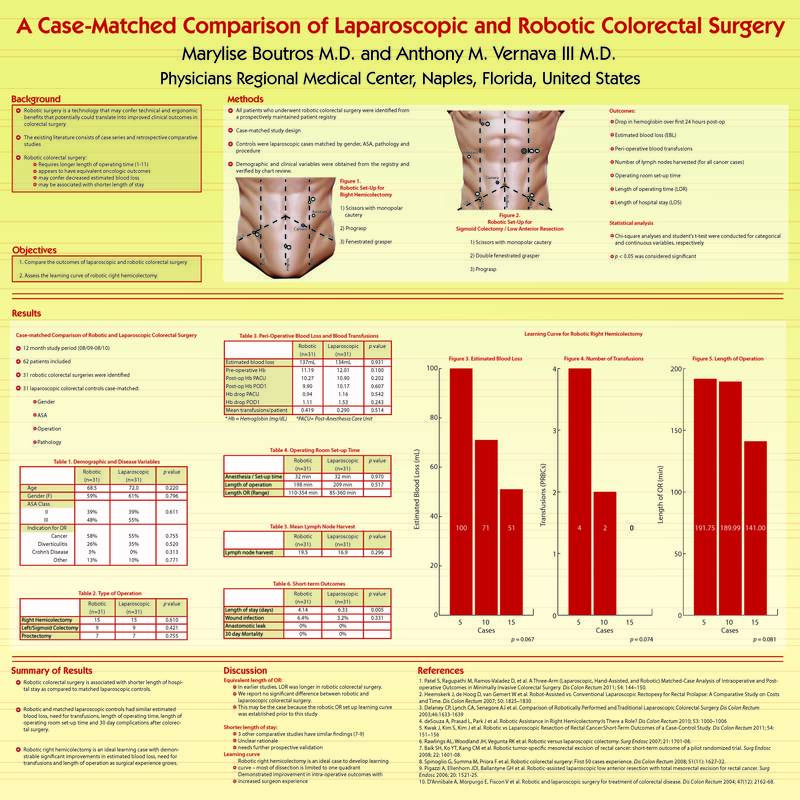 Results: Thirty-one patients underwent robotic colorectal resections (ROB) over a 6 month period (02/10-08/10); these were case-matched to 31 patients who underwent laparoscopic colorectal surgery (LAP) in the same time period. The LAP and ROB groups were similar in age (72.0 vs. 68.5 yrs, p=0.220), gender (61% vs. 59% female, p=0.796) and ASA class (ASA2 39% and ASA3 55% vs ASA2 39% and ASA3 48%, p= 0.611). Indication for operation was also similar between LAP and ROB groups: malignancy (55% vs. 58%, p=0.755), diverticular disease (35% vs. 26%; p=0.520) Crohn’s disease (0% vs. 3%, p= 0.313). In each group there were 15 right, 9 left/sigmoid and 7 rectal resections performed. The mean difference observed between LAP and. ROB resections was not significantly different for peri-operative hemoglobin drop (0.942 vs. 1.16, p=0.542), EBL (137mL vs. 134 mL, p=0.931), number of peri-operative blood transfusions/patient (0.419 vs. 0.290, p=0.514), number of lymph nodes harvested (16.9 vs. 19.5, p=0.296), operating room set-up time (32 min in both groups) and LOR (198 min vs. 209 min, p=0.517). However, there was a significant difference in LOS (6.3 days vs. 4.1 days, p=0.005) between LAP and ROB colectomies. Furthermore, regarding ROB right hemicolectomies, significant improvements were observed in mean EBL (51mL vs. 100mL, p=0.05) and LOR (141 vs. 202 min, p= 0.05) for the last 7 cases compared to the first 8 cases. Conclusions: In our experience, robotic colorectal surgery is associated with significantly shorter LOS, without any significant difference in operating room set-up time or LOR compared to laparoscopic colorectal cases. Right hemicolectomies may be the ideal robotic learning case, with demonstrable significant improvements in EBL and LOR as surgical experience grows.